With Jinhyun Cha: Post-Border Line. Panel Discussion and Screen Printing Event: Saturday, February 9, 3 p.m. Participants will include: Chip Thomas, Thea Gahr, Jesse Hazelip and Ryan Pinto, who will also perform a dance based in the grass dance tradition and hip-hop. 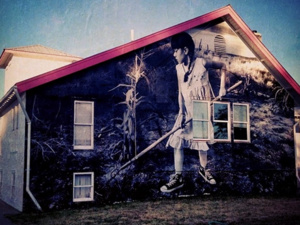 In Messages from the Underworld, Chip Thomas brings together a diverse range of photo-based work, including wheat paste murals, installations and screen prints, to focus on the many ways that the agricultural development of corn has shaped the land, people, and cultures of the Americas. Chip Thomas, aka “jetsonorama,” is a native of North Carolina and a photographer, public artist, activist and physician who has been working between Monument Valley and The Grand Canyon in the Navajo Nation since 1987. He coordinates the Painted Desert Project – a community building effort which manifests as a constellation of murals across the western Navajo Nation, painted by artists from all over the world. Thomas is a member of the Justseeds Artists Co-operative, an international cooperative of 30 socially engaged artists. His large-scale photographs can be seen pasted in the northern Arizona desert, on the graphics of the Peoples Climate March, the National Geographic Blog, 350.org and the Huffington Post.